Porter Cable buffer: Is it still the king or time for a replacement? The Porter Cable buffer seems to be a hit with both professionals and enthusiasts alike. A quality built piece of equipment that has a long list of features and benefits, there is little mystery as to why it has grown in popularity over the years. Enter any of the many car forums on the Internet, and you will see hundreds of posts regarding this tool that is recommended over and over to beginners looking to take their car paint to the next level of amazing! 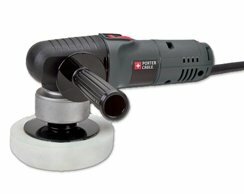 User friendly operating speeds and controls make this polisher from Porter Cable a #1 choice for many people. 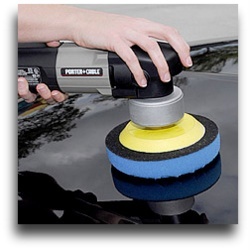 Marketed as the most user-friendly, paint-safe car polisher. Ideal for any true new beginner due to low operating speeds. Perfect for the polishing master looking to take paint finishing to the highest levels. The Porter Cable is a dual-action, or orbital polisher. It is referred to a dual action since it has a head that rotates on (2) separate points that is designed to replicate the motion of your hand. The easiest way for most to understand this is to compare the (2) movements to that of the spinning of the earth, as it circles around the sun. Due to the lower speeds of the Porter Cable orbital, it is ideally suited for any true beginner looking for improved performance over hand polishing and waxing. Unlike the higher speeds of a rotoary or high-speed polisher, the Porter Cable buffer is completely safe; you would literally have to try and damage your car paint in order for this tool to be unsafe. Pro: Perfect for any beginner looking to enter the world of paint polishing. Remove superficial scratches, restore shine, luster and depth to your car's paint. Easy to use and completely safe for all paint finishes and types. Also for the true master paint finisher to remove trace swirl marks after any use of a rotary car buffer. These heavy duty jobs typically require the use of wool polishing pads as a starting point which cannot be used with orbital car buffers. The Porter Cable buffer is popular for a reason; it is a good tool and is an ideal choice for any beginner! Also ideal if you lack the refined skills as a professional when you are unable to completely remove swirl marks from car paint through use of a rotary buffer. Are you on a very tight budget? Are you thinking of getting into the world of professional detailing, but want to test the waters on your own cars, or a few of your family and friends car's? Are you a person that is willing to spend the money the first time around so you don't have to repeat the process in the future? Are you a complete beginner or limited experience? Use the secure links below to get your own Porter Cable polisher and take your car paint to the next level and become the envy of your neighborhood or car club! The kit below will not only you save you money by bundling everything you will need together, but will also save you time by trying to pick and choose everything you will need to take your paint to the next level of perfection! Porter Cable has been the reigning champion when it comes to orbital car polishers for years. It still remains popular with people who want to fall back onto a "sure thing" based on the endless years it has been around. Not my professional first choice; but you will be able to produce great results with this kit. Does not come with detailing clay like the Griot's kit below. Welcome to a new age in car polishing! Complete kit to polish and wax your car. Everything you will need to restore shine, depth, and luster to your car paint. Top rated random orbital car polisher. Torq has excellent reviews and represents the latest in orbital car buffers. Everything needed in this kit to produce professional grade results even if you are a first timer! Ideal for any driveway detailer or a beginner just getting into the business of professional detailing. Get value as it won't break the bank if you want performance, without the need for the best of the best. This kit does not contain any detailing clay like the Griot's kit above. Any of the choices on this page will absolutely work for you. The difference choices all have their own "personalities", but every one of them will perform. The more you pay, the better the user experience will be.